Since graduating I completed my Preceptorship on Derriford's Elective Joint Unit and shortly after transferred over to the Orthopaedic Trauma Unit. After a couple of months I applied for and was successful in gaining a Band 6 Position which I absolutely love! It was a huge step for me as I have only just been qualified 12 months, but I have always embraced a challenge. I also am a Schwartz Round Facilitator for the University and PHNT, a role which allows me to explore the emotional aspects of multi-professional healthcare. I am passionate about Schwartz and would encourage everyone to attend a Round. In Spring 2017 I completed my mentorship preparation course so I now mentor student nurses in my clinical role and assist in clinical skills sessions as a Clinical Demonstrator for the Adult Nursing Team at the University. I really enjoy supporting others in their learning so being able to do this as part of my everyday work is incredibly rewarding. As for what's next I will be looking into study at masters level in the near future. How has your degree helped/influenced your career path? 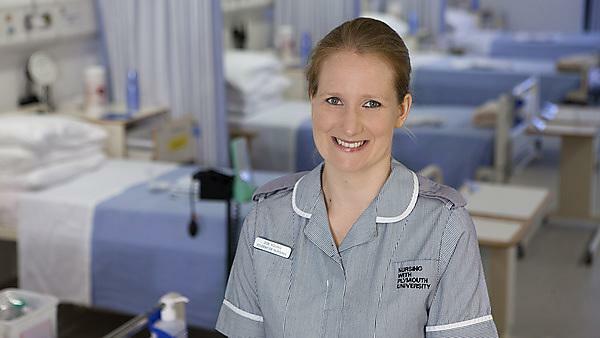 The exciting range of community and acute placements I had as a nursing student have given me the confidence to truly embrace nursing in different environments and has also shown me that I have developed the skills I need to really make a difference. Having a degree in nursing is really important in today’s healthcare environment as more and more responsibility is placed on nurses. I feel it has helped me to involve patients in making the correct decisions for them. I feel like I am at my most difficult point in my career right now. I am excited and feel ready to start my position as a Registered Nurse, yet I am anxious and worried about the transition! I no longer have my student status to protect me, but will be responsible and accountable for every decision I make. However, being degree educated means I have everything I need to ensure I can be the best possible nurse I can be and be an advocate for my patients. I have been very fortunate to have been involved in extra-curricular activities which have allowed me to present in front of international audiences, facilitate learning in other students, and travel to Barcelona to take part in the European Network of Nurse Education 2016. For me, the past three years at Plymouth have been exhausting and tough yet exciting and rewarding! The best moment for me was in our final week, sitting with my peers and realising that as a cohort we had arrived at the end of our student journey together. I would have done this years ago! As a mature student, I was worried about returning to education but completing my nursing degree has been so rewarding and has given me the confidence to become a Registered Nurse. I would encourage anyone who truly wants to be a nurse to do it! Studying a degree in nursing is not easy; in fact, I think it is one of the hardest degrees there is, but it is definitely the most rewarding. Make sure to prepare before you start by ensuring your maths, English and biology skills are up to speed: this will definitely help you and the way in which you approach care experience. Plymouth is a great place to study nursing because the University is located in a beautiful part of the country and the support available to students is fantastic. For me, the most valuable asset the University has is its staff and students. The academics within the School of Nursing and Midwifery are amazing and, providing you work hard and truly want to be there, they will go above and beyond to help, support, and guide you to ensure you get the best nursing education possible. Fellow students on your course become your closest allies and you will laugh, cry, sweat, celebrate, and commiserate together on the roller coaster that is a nursing degree. What lessons/skills did you gain from your course? I learnt that I am capable of studying at degree level and that I can do much more than I ever thought possible. I can stand in front of an audience now and talk freely about something which I am passionate about and believe in, justifying my decisions and actions using evidence to back up my argument both on paper and face-face. I never believed I would actually make it through the course and yet I have managed to secure a first class honours degree and successfully enter onto the nursing register with the NMC. Yes, I had nine placements over my three years and loved every single one of them. Placements truly help to consolidate your learning and link theory to practice. Placements are also the only way to truly discover the amazing scope there is in nursing. I loved how I could move from a fast paced acute ward in a hospital to then becoming part of a community drug and alcohol team in primary care. The mentors who watched over me ensured not only that I was ready to progress each time but that I had made the most of my experience and opportunities in each clinical area. There are too many to pick, but some of the highlights for me are the first time I really felt like I had made a difference to a patient, receiving pass results for modules, and the last day at university when we sang, cried, and laughed together as a cohort with our academics because we had survived our journey together. I am also really looking forward to graduation day on Plymouth Hoe. Do you stay in touch with other University alumni or lecturers? Yes, I stay in touch with lecturers, my placement mentors, and my peers. In fact, I hope to return to Plymouth to complete a postgraduate degree now that I have discovered my passion for learning. I would also like to return to Plymouth eventually as a Clinical Demonstrator or Associate Lecturer as I love helping others to learn! Would you recommend undertaking a course with the University, and why? I would definitely recommend studying nursing with Plymouth because the School of Nursing and Midwifery offer the best support and are always trying to improve the student experience. I would also encourage students to take every opportunity to get involved wherever you can; as a PALs Leader, a course representative, joining pilot projects or research teams, allowing you to broaden your skills and abilities which can only help you to become a better nurse! Good luck on your nursing journeys. Have fun and work hard – you won’t regret it!